Bolivia, the land of incredible views, salt flats, Cholitas and tonnes of flamingoes. 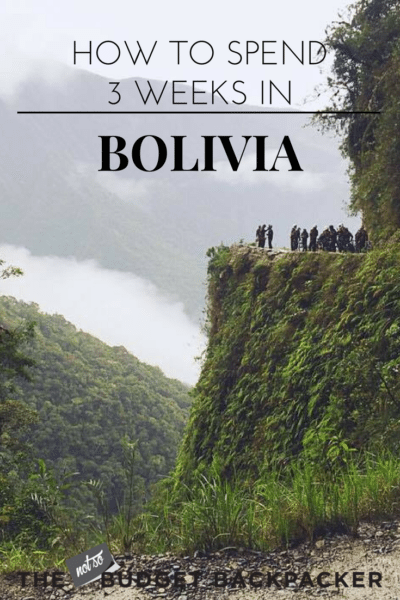 I recently explored this incredible country from top to bottom and discovered all the things to do in Bolivia when you have 3 weeks. 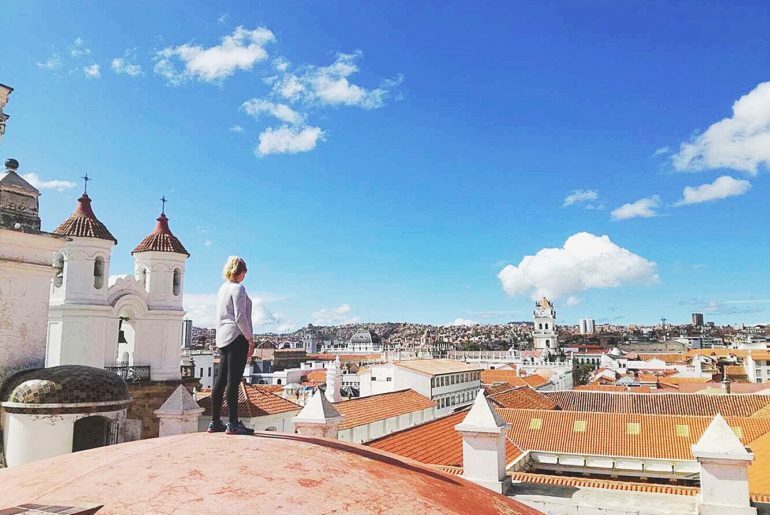 Start your trip in Bolivia with some of the most incredible views in South America. 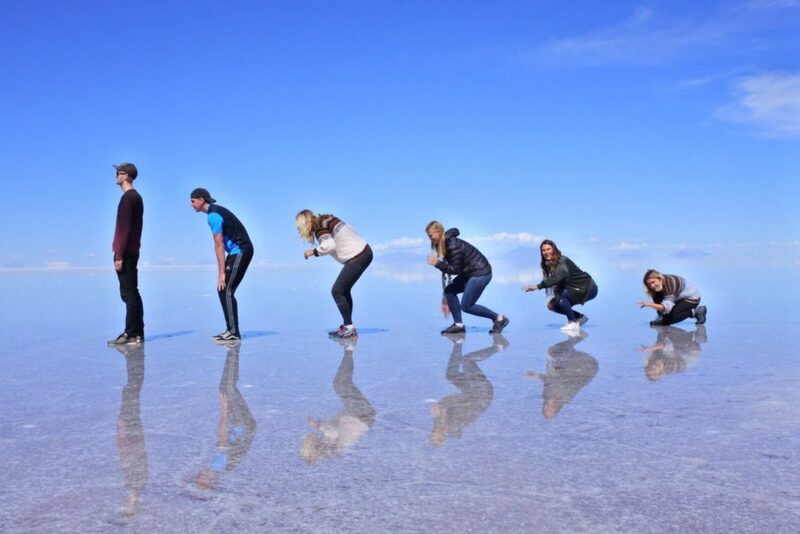 Your salt flats tour should set you back about $150USD and is one of the top things to do in Bolivia. 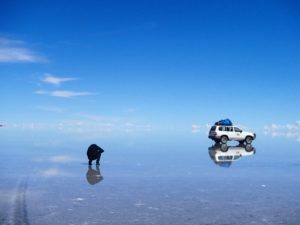 You’ll experience sites like pink bodies of water, flamingoes, incredible reflective lakes, train graveyards and of course the insanely photogenic Salar De Uyuni. For more information check out my tips on How To Choose The Right Salt Flats Tour. As soon as you finish your tour in Uyuni, jump on the first bus out of there to Potosí. We took a local afternoon bus that took about 6 hours and set us back about $5USD. Potosí at one time was the richest city in all of South America with their mine producing enough silver to build a bridge all the way to Spain. Now years later with little silver being found and very poor working conditions they say the bones found in the mine could build a bridge to Spain and back. Spend two days here, one exploring the pretty little town and the second taking a tour of the mine. 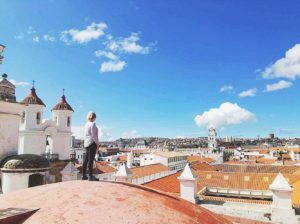 We booked our tour through Hostel Casa Blanca and I couldn’t recommend it more highly. The guide was an absolute legend. I will warn you though. The tour is very confronting as you are literally entering a working mine which is incredibly dark, dusty and you can hear dynamite exploding around you every few minutes. Next on your list of things to do in Bolivia is Sucre, a quick three hour bus journey that will set you back about $5USD. We entered Sucre with a bang meeting some awesome people in our hostel (Kultur Berlin) and spending a few big nights on the town. Not only is Sucre a great place to party it’s also one of South America’s premier spots to learn Spanish. We took Spanish lessons with Sucre Spanish School and I’d recommend them for beginners to intermediates. Known as The White City due to its bright and picturesque streets, Sucre an excellent place to chill out, take in some culture and learn some Spanish. I’d also really recommend staying at Kultur Berlin. While it’s known to be a party hostel, the rooms away from the bar are quiet and the breakfast is the best I had in South America. La Paz is one of the craziest towns in South America and the highest capital city in the world. So prepare yourself to be huffing and puffing around the streets. On top of the insanely high altitude it’s absolutely packed with ways to spend your time. We spent four nights here and stayed at the notorious party hostel The Wild Rover. Start your five days by taking one of the free walking tours. We went with Red Cap Tours who were both entertaining and informative. The 3 hour walking tour will give you a great overview of the city and take you to places like: the witches market; the fruit and veg market; San Pedro prison; San Francisco church and plaza; and show you where to get some super cheap and delicious local food. 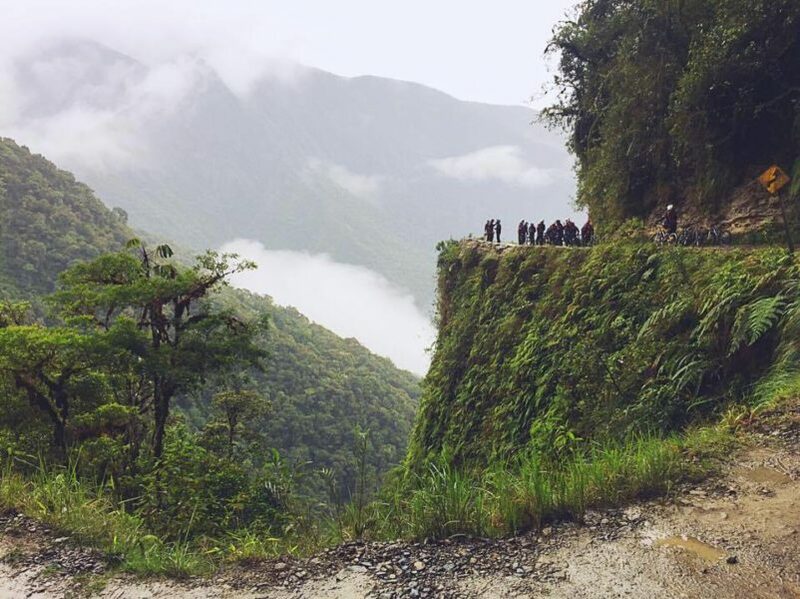 Other must-do’s include: cycling down the most dangerous road in the world – Death Road; the picturesque streets of Calle Jaen; the totally instagrammable views from the cable cars; chatting with a real life ex-prisoner from the infamous San Pedro prison; and spending an afternoon at the Cholita Wrestling, a WWE style of wrestling where the local women take to each other with things like cakes, chairs and wooden boxes. After the dizzying heights (in more ways than one) of La Paz, Copacabana is a good place to chill out for a couple of days before visiting Isla Del Sol. While there’s not too much to do in the actual town, spend a day pottering around, drinking coffee and trying the local dish – deep-fried trucha (trout) from the little food market by the lake. You can also hike to the up one of the nearby hills for a beautiful view of Lake Titicaca and explore the large church in the main plaza. 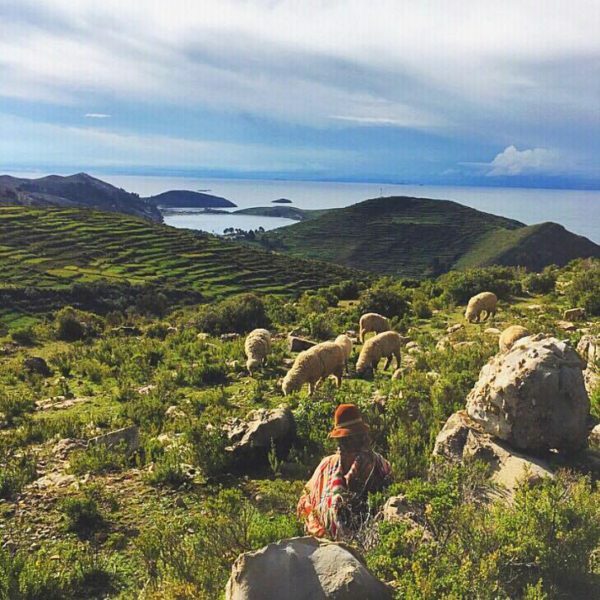 A Cholita and her sheep in Isla Del Sol. Isla Del Sol is a tiny island in the middle of the famous Lake Titicaca. According Inca legend it’s where the sun was born and is a nice little stop for a night or two. Spend the day hiking to the two view points on the Southern side of the island for some totally insta-worthy shots. The island has no cars so it’s lovely to sit back and just watch the authenticity of the people who live there working only with donkeys and alpacas. Unfortunately due to disputes between the north, centre and south regions it’s no longer possible to hike from the south to the north, so if you want to visit the other side you’ll need to take a boat. 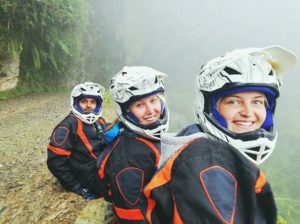 want more info on Things to do in Bolivia? check these out! Thanks for that, Emma – it brought back some great memories of my time there in 2012! I missed a lot of Bolivia, such as Sucre and Potosi…but it’s a good reason to go back 🙂 So sad to hear about the conflict on Isla del Sol, though. Definitely a good reason to go back! Perfect excuse! Yea hopefully Isla Del Sol can work it all out and start the tourism passing through again.